This image of the earth and moon "Blue Marble 2000" was created by R. Stöckli, A. Nelson and F. Hasler, Laboratory for Atmospheres, NASA Goddard Space Flight Center, using data from NASA, the USGS and NOAA. It is a mosaic of data from three satelites based on conditions on September 9, 1997. The geosciences began their modern incarnation in 1957 with the 18-month long International Geophysical Year (IGY). The IGY saw a global mobilization of effort to investigate all aspects of the Earth and the space environment. While American and Soviet space vehicles made startling new discoveries about the Earth's magnetic field and the Van Allen belt, strong observational evidence was added to reinforce the plate tectonic revolution. New insights were obtained relating to the structure and dynamics of the earth's interior, both mantle and core. During the 1950s and 1960s, digital computers made it possible to model the atmosphere and oceans and, ultimately, to predict weather and climate as fluid media. The last four decades have been monumental years of discovery and accumulation of facts and detailed data on the solid earth, ocean, atmosphere, and space sciences. Significant theoretical insight concerning these topics has emerged, but deep problems remain to challenge conventional methodologies and insights derived from the physical sciences. The time is ripe to apply mathematical modeling and analysis techniques, including newer methods in continuous and discrete dynamical systems, stochastic processes, homogenization, and multiscale asymptotics to our investigation of these problems. The geosciences today provide an impressive array of important problems that should command the attention of applied mathematicians. 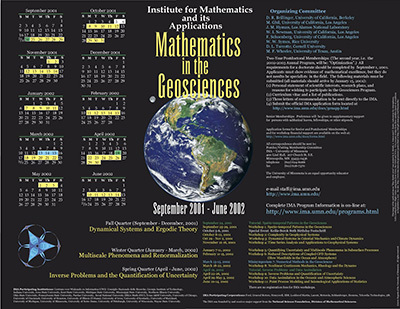 In addition, the geosciences offer the opportunity as well as the need to advance the foundations and techniques of applied mathematics to meet this challenge. The time is right to initiate an International Mathematical Geosciences Year (IMGY) to bring mathematicians and geoscientists together in the investigation of our planet and the environment within which it resides. We present a three-quarter program designed to introduce mathematicians to the major themes and techniques of the geosciences, and create a focal point for a multidisciplinary assault on some of the outstanding problems emerging from them. Accordingly, the three quarters are organized along methodological lines, beginning with dynamical systems and ergodic theory, then moving on to multiscale problems and renormalization, and concluding with inverse problems and the quantification of uncertainty. Important progress has been made in understanding the dynamics of the earth's crust, especially earthquakes. The availability of new data opens new applications for modern mathematical technique. The theoretical understanding of large-scale atmospheric and oceanic flows, and of the coupled atmosphere-ocean-cryosphere-biosphere climate system, is being revolutionized by the insights provided by dynamical systems theory and its statistical complement, these systems' ergodic theory. Similarly, significant new insights have emerged in applications of dynamical systems theory to problems relevant to the earth's interior. Analysis, simulation, and prediction of geophysical processes, ranging from climates to earthquakes, are likely to make much more rapid progress by bringing the appropriate mathematical and statistical tools to bear on them. The description of many natural phenomena naturally introduces a high degree-of-freedom system which takes the form of a continuum, described by partial differential equations, or of discrete systems. Another venue for multiscale phenomena manifests in the field of point processes, and the development of linear and nonlinear models.